The CR1000KD is a portable keyboard and display screen for our data loggers that have a CS I/O port, including the CR1000, CR1000X, CR800, CR850, and CR6. It allows you to check the data logger's status, display or plot sensor readings and stored values, and enter numeric data or change port/flag state. One CR1000KD may be carried from station to station in a data logger network. The CR1000KD displays 8 lines x 21 characters (64 x 128 pixels) and has a 16-character keyboard. 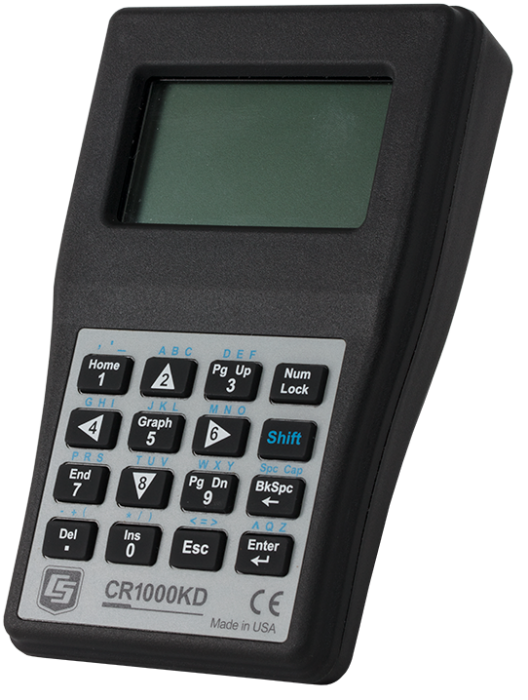 The CR1000KD is powered by the data logger power supply. An SC12 cable connects the CR1000KD to the data logger; the two connectors on the SC12 cable allow the attachment of additional peripherals.